"Bogomil" redirects here. For the name, see Bogomil (name). Bogomilism (Bulgarian: Богомилство, Serbo-Croatian: Bogumilstvo/Богумилство) was a Christian neo-Gnostic or dualist sect founded in the First Bulgarian Empire by the priest Bogomil during the reign of Tsar Peter I in the 10th century. It most probably arose in what is today the region of Macedonia as a response to the social stratification that occurred with the introduction of feudalism and as a form of political movement and opposition to the Bulgarian state and the church. The Bogomils called for a return to what they considered to be early spiritual teaching, rejecting the ecclesiastical hierarchy, and their primary political tendencies were resistance to the state and church authorities. This helped the movement spread quickly in the Balkans, gradually expanding throughout the Byzantine Empire and later reaching Kievan Rus', Bosnia (Bosnian Church), Dalmatia, Serbia, Italy, and France (Cathars). The Bogomils were dualists or Gnostics in that they believed in a world within the body and a world outside the body. They did not use the Christian cross, nor build churches, as they revered their gifted form and considered their body to be the temple. This gave rise to many forms of practice to cleanse oneself through purging,[clarification needed] fasting, celebrating and dancing. The term Bogomil in free translation means "dear to God", and is a compound of the Slavic words for "god" (Common Slavic: *bogъ) and "dear" (Common Slavic: *milъ). It may be also a translation of the Greek name Theophilos, literally "dear to God; loved by the gods," from theos "god" + philos "loved, beloved". It is difficult to ascertain whether the name was taken from the reputed founder of that movement, the priest Bogomil (Bulgarian: Богомил), or whether he assumed that name after it had been given to the sect itself. The word is an Old Church Slavonic calque of Massaliani, the Syriac name of the sect corresponding to the Greek Euchites. The Bogomils are identified with the Messalians in Slavonic documents from the 13th century. The members are referred to as Babuni in Church Slavonic documents, which originally meant "superstition; superstitious person" (Common Slavic *babonъ, *babunъ *babona). Toponyms which retain the name include the river Babuna, the mountain Babuna, the Bogomila Waterfall and village Bogomila, all in the region of Azot today in central North Macedonia, suggesting that the movement was very active in the region. Much of their literature has been lost or destroyed by the contemporary Christian Churches. The earliest description of the Bogomils is in a letter from Patriarch Theophylact of Bulgaria to Tsar Peter of Bulgaria. The main source of doctrinal information is the work of Euthymius Zigabenus, who says that they believe that God created man's soul but matter was the invention of Satan, God's older son, who in seducing Eve lost his creative power. Concerning the Bogomils, something can be gathered from the polemic Against the Newly-Appeared Heresy of the Bogomils written in Slavonic by Cosmas the Priest, a 10th-century Bulgarian official. The old Slavonic lists of forbidden books of the 15th and 16th century also give us a clue to the discovery of this heretical literature and of the means the Bogomils employed to carry on their teachings. Much may also be learned from the doctrines of the numerous variations of Bogomilism which spread in Medieval Kievan Rus' after the 11th century. One of the earliest Christian dualist sects, Marcionism, originated in eastern Anatolia. The church Marcion himself established, appeared to die out around the 5th century, although similarities between Marcionism and Paulicianism, a sect in the same geographical area, indicate that Marcionist elements may have survived. Paulicianism began in the mid-7th century, when Constantine of Mananalis, basing his message solely on the New Testament, began to teach that there were two gods: a good god who had made men's souls, and an evil god who had created the entire physical universe including the human body. His followers, who became known as Paulicians, were not marked by extreme deviance in lifestyle compared to contemporaries, despite their belief that the world was evil, and were renowned as good fighting men. In 970 the Byzantine emperor John I Tzimiskes transplanted 200,000 Armenian Paulicians to Europe and settled them in the neighbourhood of Philippopolis (today's Plovdiv in Thrace). Under Byzantine and then later Ottoman rule, the Armenian Paulicians lived in relative safety in their ancient stronghold near Philippopolis, and further northward. Linguistically, they were assimilated into the Bulgarians, by whom they were called pavlikiani (the Byzantine Greek word for Paulician). In 1650, the Roman Catholic Church gathered them into its fold. Fourteen villages near Nicopolis, in Moesia, embraced Catholicism, as well as the villages around Philippopolis. A colony of Paulicians in the Wallachian village of Cioplea [ro] near Bucharest also followed the example of their brethren across the Danube. The religious distribution at the time of the East–West Schism, showing Bogomils concentrated in the Balkans. 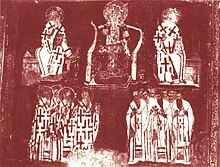 The Gnostic social-religious movement and doctrine originated in the time of Peter I of Bulgaria (927–969), alleged in the modern day to be a reaction against state and clerical oppression of the Byzantine church. In spite of all measures of repression, it remained strong and popular until the fall of the Second Bulgarian Empire in the end of the 14th century. Bogomilism was an outcome of many factors that had arisen in the beginning of the 10th century, most probably in the region of Macedonia. It was also strongly influenced by the Paulicians who had been driven out of Armenia. The Slavonic sources are unanimous on the point that Bogomil's teaching was Manichaean. A Synodikon from the year 1210 adds the names of his pupils or "apostles", Mihail, Todur, Dobri, Stefan, Vasilie and Peter. Zealous missionaries carried their doctrines far and wide. In 1004, scarcely 25 years after the introduction of Christianity into Kievan Rus, we hear of a priest Adrian teaching the same doctrines as the Bogomils. He was imprisoned by Leontius, Bishop of Kiev. In 1125, the Church in the south of Rus had to combat another heresiarch named Dmitri. The Church in Bulgaria also tried to extirpate Bogomilism. Several thousand went in the army of Alexios I Komnenos against the Norman, Robert Guiscard; but, deserting the emperor, many of them (1085) were thrown into prison. Efforts were again put forth for their conversion; and for the converts the new city of Alexiopolis was built, opposite Philippopolis. When the Crusaders took Constantinople (1204), they found some Paulicians, whom the historian Geoffrey of Villehardouin calls Popelicans. The Legend of Saint Gerard discloses that followers of Bulgarian Bogomilism were present during the early 11th century in Ahtum's realm, which comprised present day Banat. They invoked Archangel Uriel, whose name is common in amulets and magic rituals. The Bogomils spread westwards and settled in Serbia, where they were to be known as Babuns (Babuni). At the end of the 12th century Serbian Grand Prince Stefan Nemanja and the Serbian council deemed Bogomilism a heresy, and expelled them from the country. Large numbers took refuge in Bosnia and Dalmatia where they were known under the name of Patarenes (Patareni). Providing refuge to heretics, including bogomils, was a recurrent pretext for Hungarian rulers to declare crusades against Bosnia and extend their influence in the region. A first Hungarian complaint to the Pope was averted by the public abjuration of the Bosnian ruler Ban Kulin in 1203. A second Hungarian crusade against Bosnia on bogomil heresy pretext was launched in 1225, but failed. In 1254, rebelling against the Papal order to accept a Hungarian bishop, the Bosnian Church chose the schism. In the following centuries, the Bosnian Church (autonomous from Rome but mainly following Catholic doctrine) and the heretic sect of the bogomils came to be identified with each other, due to the scarcity of documents after the Ottoman conquest. In 1203, Pope Innocent III, with the aid of the King of Hungary, forced an agreement of Kulin to acknowledge Papal authority and religion: in practice this was ignored. On the death of Kulin in 1216 a mission was sent to convert Bosnia to Rome but failed. In 1234, the Catholic Bishop of Bosnia was removed by Pope Gregory IX for allowing heretical practices. In addition, Gregory called on the Hungarian king to crusade against the heretics. However, Bosnian nobles were able to expel the Hungarians. In 1252, Pope Innocent IV decided to put Bosnia's bishop under the Hungarian Kalocsa jurisdiction. Such decision provoked the schism of the Bosnian Christians, who refused to submit to the Hungarians and broke off their relations with Rome. In that way, an autonomous Bosnian Church came into being, in which some later saw a Bogomil or Cathar Church, while in reality no trace of bogomilism, Catharism or dualism can be found in the original documents of the Bosnian Christians. It was not until Pope Nicholas' Bull "Prae cunctis" in 1291 that the Franciscans-led inquisition was imposed on Bosnia. The Inquisition reported of the existence of a dualist sect in Bosnia in the late 15th century and called them "Bosnian heretics", but this sect was most likely not the same as the Bosnian Church. Bogomilism was eradicated in Bulgaria and Byzantium in the 13th century, but survived in Bosnia and Herzegovina until the Ottoman Empire gained control of the region in 1463. Both Catholics and Orthodox persecuted the Bogomils as heretics. The early pressures by its Catholic and Orthodox neighbours drew Bosnia to Bogomilism. Later, with the introduction of Ottoman rule, Bosnians were often more likely to convert to Islam since they were not friends of either the Roman Catholic or Serb Orthodox churches. From Bosnia, their influence extended into Italy (Piedmont). The Hungarians undertook many crusades against the heretics in Bosnia, but towards the close of the 15th century, the conquest of that country by the Turks put an end to their persecution. Few or no remnants of Bogomilism have survived in Bosnia. The Ritual in Slavonic written by the Bosnian Radoslav, and published in vol. xv. of the Starine of the South Slavonic Academy at Agram, shows great resemblance to the Cathar ritual published by Cunitz, 1853. In the 18th century, the Paulician people from around Nicopolis were persecuted by the Turks, presumably on religious grounds, and a good part of them fled across the Danube and settled in the Banat region that was part of the Kingdom of Hungary at the time, and became known as Banat Bulgarians. There are still over ten thousand Banat Bulgarians in Banat today in the villages of Dudeştii Vechi, Vinga, Breştea and also in the city of Timişoara, with a few in Arad; however, they no longer practice Bogomilism, having converted to Roman Catholicism. There are also a few villages of Paulicians in the Serbian part of Banat, especially the villages of Ivanovo and Belo Blato, near Pančevo. The gradual Christianization of the Bulgarian population, the fact that the service was initially practiced in Greek, which only the elite knew, resulted in a low level of understanding of the religion among the peasantry. Due to the constant wars during the time of Simeon I, the lands near the Byzantine border (Thrace) were devastated, and the people living there were left without occupation. The constant change of authority over these lands, and the higher taxes during the time of Tsar Peter I, gave birth to a great social discontent at the beginning of the 10th century. Moreover, the corruption of the church as an institution, led to grave disappointment among its recently converted flock. The existence of older Christian heresies in the Bulgarian lands (Manichaeism and Paulicianism), which were considered very dualistic, influenced the Bogomil movement. Manichaeism's origin is related to Zoroastrianism; that is why Bogomilism is sometimes indirectly connected to Zoroastrianism in the sense of its duality. Some historians claim that tsar Samuil of Bulgaria and in particular his son Gavril Radomir supported the movement. The core of Bulgarian empire then corresponded to the region where the Bogomils were most active. Most probably, as Samuil revolted against the Byzantine Empire, he relied on the popular support of the movement. There are no sources of Bogomil persecution during his reign (976–1014). From the imperfect and conflicting data that is available, one positive result can be gathered that the Bogomils were gnostics, adoptionists and dualists. Their dualism was initially moderate (or "monarchian"): according to their teachings, God created and rules the spiritual part of the world, and Satan the material, but Satan is ultimately inferior to God and his side by virtue of being God's son. However, Bogomils were not quite free from the absolute dualism of Manichaeism and Paulicianism, and over time adopted an absolute position too, believing God and Satan as eternal opponents, similar to the one maintained by the posterior Cathars. Their adoptionist teaching apparently came from Paul of Samosata (though at a later period the name of Paul was believed to be that of the Apostle). They rejected the Christianity of the Orthodox churches, though did not accept the docetic teaching of some of the other gnostic sects. They also opposed established forms of government and church as alike to anarchism (see Christian anarchism). The Bulgarian priest Jeremiah's "The Story of the Cross-tree" and "The Prayer against Fever"
Bogomils accepted the four Gospels, fourteen Epistles of Paul, the three Epistles of John, James, Jude, and an Epistle to the Laodiceans, which they professed to have. They sowed the seeds of a rich, popular religious literature in the East as well as the West. The Historiated Bible, the Letter from Heaven, the Wanderings through Heaven and Hell, the numerous Adam and Cross legends, the religious poems of the "Kalēki perehozhie" and other similar productions owe their dissemination to a large extent to the activity of the Bogomils of Bulgaria, and their successors in other lands. In their original monarchian dualist story, Bogomils taught that God had two sons, the elder Satanail and the younger Michael. Satanail rebelled against the father and became an evil spirit. He created the lower heavens and the Earth and tried in vain to create man, though in the end he had to appeal to God for the Spirit. After creation, Adam was allowed to till the ground on condition that he sold himself and his posterity to the owner of the Earth, Satanail. In order to free Adam and his offspring, Michael was sent in the form of a man, becoming identified with Jesus Christ, and was "elected" by God after the baptism in the Jordan. When the Holy Ghost appeared in the shape of the dove, Jesus received power to break the covenant in the form of a clay tablet (hierographon) held by Satanail from Adam. He had now become the angel Michael in a human form, and as such he vanquished Satanail, and deprived him of the termination il (meaning God), in which his power resided. Satanail was thus transformed into Satan. However, through Satan's machinations the crucifixion took place, and Satan was the originator of the whole Orthodox community with its churches, vestments, ceremonies, sacraments and fasts, with its monks and priests. This world being the work of Satan, the perfect must eschew any and every excess of its pleasure, though not so far as asceticism. They held the "Lord's Prayer" in high respect as the most potent weapon against Satan, and had a number of conjurations against "evil spirits". Each community had its own twelve "apostles", and women could be raised to the rank of "elect". The Bogomils wore garments like those of mendicant friars and were known as keen missionaries, travelling far and wide to propagate their doctrines. Healing the sick and exorcising the evil spirit, they traversed different countries and spread their apocryphal literature along with some of the books of the Old Testament, deeply influencing the religious spirit of the nations and preparing them for the Reformation. For Bogomils "the Logos was not the Second Person of the Blessed Trinity, the Eternal Word incarnate, but merely the spoken word of God, shown in the oral teaching of Christ". Although Bogomils regarded themselves as "Trinitarian", anathemas against Bogomils (circa 1027) charge Bogomils with rejection of the Trinity. The essence of Bogomilism is the duality in the creation of the world. This is why it is considered a heresy by the Catholic Church. Bogomils explained the earthly sinful corporeal life as a creation of Satan, an angel that was sent to Earth. Due to this duality, the church believes that their doctrine undervalues everything that is created with materialistic and governmental goals and further claims that the doctrine does not come from the soul, the only divine possession of the human. [clarification needed] Its followers refused to pay taxes, to work in serfdom, or to fight in conquering wars. They ignored the feudal social system, which was interpreted by their enemies as suggesting disorder if not the destruction of the state and church. Karp Strigolnik, who in the 14th century preached the doctrine in Novgorod, explained that St. Paul had taught that simpleminded men should instruct one another; therefore they elected their "teachers" from among themselves to be their spiritual guides, and had no special priests. There is a tradition that the Bogomils taught that prayers were to be said in private houses, not in separate buildings such as churches. Ordination was conferred by the congregation and not by any specially appointed minister. The congregation were the "elect", and each member could obtain the perfection of Christ and become a Christ or "Chlist". Marriage was not a sacrament. Bogomils refused to fast on Mondays and Fridays, and they rejected monasticism. They declared Christ to be the Son of God only through grace like other prophets, and that the bread and wine of the eucharist were not physically transformed into flesh and blood; that the last judgement would be executed by God and not by Jesus; that the images and the cross were idols and the veneration of saints and relics idolatry. These doctrines have survived in the great Russian sects, and can be traced back to the teachings and practice of the Bogomils. But in addition to these doctrines of an adoptionist origin, they held the Manichaean dualistic conception of the origin of the world. This has been partly preserved in some of their literary remains, and has taken deep root in the beliefs and traditions of Balkan nations with substantial Bogomil followings. The chief literature of all the heretical sects throughout the ages has been that of apocryphal Biblical narratives, and the popes Jeremiah or Bogumil are directly mentioned as authors of such forbidden books "which no orthodox dare read". Though these writings are mostly of the same origin as those from the older lists of apocryphal books, they underwent a modification at the hands of their Bogomil editors, so as to be useful for the propagation of their own specific doctrines. In its most simple and attractive form—invested with the authority of the reputed holy author—their account of the creation of the world and of man, the origin of sin and redemption, the history of the Cross, and the disputes between body and soul, right and wrong, heaven and hell, were embodied either in "Historiated Bibles" (Paleya) or in special dialogues held between Christ and his disciples, or between renowned Fathers of the Church who expounded these views in a simple manner adapted to the understanding of the people (Lucidaria). The Bogomils were the connecting link between the so-called heretical sects of the East and those of the West. They were, moreover, the most active agents in disseminating such teachings in Kievan Rus' and among all the nations of Europe. In the 12th and 13th century, the Bogomils were already known in the West as "Cathars" or in other places as "Bulgari", i.e. Bulgarians (българи). In 1207 the Bulgarorum heresis is mentioned. In 1223 the Albigenses are declared to be the local Bougres, and in the same period mention is made of the "Pope of the Albigenses who resided within the confines of Bulgaria" (see also Nicetas, Bogomil bishop). The Cathars and Patarenes, the Waldenses, the Anabaptists, and in Russia the Strigolniki, and Spiritual Christians, have all at different times been either identified with the Bogomils or closely connected with them, even though several of these are unrelated and are not dualist. Considerable scholarly debate has arisen about the exact relationship between dualist heresies that arose in different places and centuries across medieval Europe, questioning whether it was indeed a single movement or belief system which was spread from one region to the next, or if multiple heretical movements arose independently in different parts of Europe. Furthering the confusion is that the medieval sources themselves, such as the 13th century papal Inquisition in France, would often simply assume that dualistic heresies were directly connected to previous heretical movements in different regions. Inquistors often described 13th century Cathars as a direct outgrowth of surviving Manichean dualists from previous centuries—though by the same logic, Inquisitors who encountered pagan religions in the fringes of Europe (Celtic lands, or in the Baltic Crusades) would directly accuse non-Christians of worshiping "Apollo and Mercury", simply applying previous terms and rhetoric to new contexts in which they didn't accurately apply. Thus medieval scholarship is divided over whether the "Cathars" actually were an offshoot of the "Bogomils", or if the 13th century Inquisition itself simply mistook "Cathars" for "Bogomils". In Foucault's Pendulum, a novel by the Italian philosopher and writer Umberto Eco, the plot concerning a widespread secret and mystic conspiracy has its ground in the disappearance of the Bogomils after the fall of the Second Bulgarian Empire under the rule of the Ottoman Empire. The Secret Book is a Macedonian feature film combining the detective, thriller and conspiracy fiction genres, based on a fictional story of the quest for the original Slavic language "Secret Book", written by the Bogomils in Bulgaria and carried to Western Europe during the Middle Ages. A French and consequently an English word emerged based on twisted perceptions of the Bogomils by the Catholic Church. The words "bouguer" and "buggery" emerged, by way of the word "bougre" in French, from the Latin Bulgarus (Bulgarian). "Buggery" first appears in English in 1330 with the sense "abominable heresy", though "bugger" in a sexual sense is not recorded until 1555. The Oxford Dictionary of English Etymology quotes a similar form—"bowgard" (and "bouguer"), but claims that the Bulgarians were heretics "as belonging to the Greek Church, sp. Albigensian". Webster's Third New International Dictionary, gives the only meaning of the word "bugger" as sodomite, "from the adherence of the Bulgarians to the Eastern Church considered heretical"..
Bogomil Cove on Rugged Island in the South Shetland Islands, Antarctica is named after Priest Bogomil. The Bogomils make a significant part in the Thomas Pynchon novel, Against the Day, when Cyprian Lakewood becomes a postulate and gives up his life of sodomitic servitude as a spy. ^ Peters, Edward (1980). Heresy and authority in medieval Europe: documents in translation, Middle Ages University of Pennsylvania Press Middle ages series. University of Pennsylvania Press. p. 108. ISBN 0-8122-1103-0. ^ Van Antwerp Fine, John (1991). The early medieval Balkans: a critical survey from the sixth to the late twelfth century. University of Michigan Press. p. 171. ISBN 0-472-08149-7. ^ Crampton, R. J. (2005). A concise history of Bulgaria, Cambridge concise histories. Cambridge University Press. pp. 18–19. ISBN 0-521-61637-9. ^ Obolensky, Dimitri (1994). Byzantium and the Slavs. St Vladimir's Seminary Press. p. 272. ^ Schuman, Michael (2004). Bosnia and Herzegovina. Infobase Publishing. p. 7. O. Dähnhardt, Natursagen, vol. 1. pp. 38 sqq. (Leipzig and Berlin, 1907). ^ a b Obolensky, Dimitry (1948). The Bogomils: A study in Balkan Neo-Manicheism. Cambridge University Press. ISBN 0-521-58262-8. ^ Loos, Milan (1974). Dualist heresy in the Middle Ages. Czechoslovak Academy of Sciences. ^ Ehrman, Bart D. Lost Christianities: The battles for scripture and the faiths we never knew. Oxford University Press, 2005. ^ "Hamilton, Janet and Bernard, Christian dualist heresies in the Byzantine world, c.650-c.1450". Archived from the original on 2011-05-27. Retrieved 2018-12-28. ^ "Bogomils of Bulgaria and Bosnia". The Reformed Reader. ^ Malcolm Lambert, Medieval Heresy:Popular Movements from Bogomil to Hus, (Edward Arnold Ltd, 1977), 143. ^ Christian Dualist Heresies in the Byzantine World, C. 650-c. 1450, ed. Janet Hamilton, Bernard Hamilton, Yuri Stoyanov, (Manchester University Press, 1998), 48-49. ^ Malcolm Lambert, Medieval Heresy:Popular Movements from Bogomil to Hus, 143. ^ Mitja Velikonja, Religious Separation and Political Intolerance in Bosnia-Herzegovina, transl. Rang'ichi Ng'inga, (Texas A&M University Press, 2003), 35. ^ Dollinger, Beiträge zur Ketzergeschichte des Mittelalters, 2 vols. (Munich, 1890). ^ a b Yuri Stoyanov (2000). The Other God: Dualist Religions from Antiquity to the Cathar Heresy (in Spanish). Yale University Press. ISBN 978-03-000825-3-1. ^ Quispel, Gilles (2008), Oort, Johannes (ed. ), Gnostica, Judaica, Catholica: collected essays, p. 11, Die Interrogatio Johannis, eine der wenigen authentischen Quellen über die Katharer, die also nicht von den Inquisitoren der römischen Kirche stammt, besitzt dieselbe Form und denselben Inhalt wie das Apokryphon des Johannes. ^ Tyerman, Christopher (2006), God's war: a new history of the Crusades, p. 573, This distinct 'Latin' dualist community probably provided western converts with Latin translations of the Greek Bogomil texts including the consolamentum ritual and the New Testament, collated with the Vulgate. ^ The Bogomils: A Study in Balkan Neo-Manichaeism Page 211 Dimitri Obolensky, 2004 "The Logos was for them not the Second Person of the Blessed Trinity, the Eternal Word incarnate, but merely the spoken word of God, manifested in the oral teaching of Christ. * Hence the Bogomils taught that Christ was ..."
^ Contra Patarenos Page 39 Hugh Eteriano, Janet Hamilton, Sarah Hamilton, 2004 "He was aware that the Bogomils regarded themselves as Trinitarians: 'Do not be astonished, my brothers', he writes,'… when you hear them say that they believe in Father, Son and Holy Spirit, that they keep the apostles and saints…"
^ Heresy in medieval France: dualism in Aquitaine and the Agenais, Page 64 Claire Taylor, Royal Historical Society (Great Britain), 2005: "Anathemas against Bogomils were in use in the early decades of the eleventh century, contained in versions of the Synodikon of orthodoxy and included in a euchologion produced in 1027. They attest to Bogomil rejection of the Trinity"
^ Bogomilism Study. Archived from the original on 2015-08-10. V. Sharenkoff, A Study of Manicheism in Bulgaria (New York, 1927). J. Meiers, Archbishop Ancient Order of Bogomil, of Americas'. J. Ivanov, Bogomilski knigi i legendi (Sofija, 1925). French translation by M. Ribeyrol, Livres et Légendes bogomiles (Paris, 1976). H. G. Beck, Vom Umgang mit Ketzern (München 1993), esp. Chapter 8. Wikimedia Commons has media related to Bogomilism.